The topic of embouchure is always controversial, and discussion of it often proves emotional. It almost seems like it can’t be discussed without somebody feeling attacked/criticized/hurt. Before we come to what I see as the main point, let’s define the term first, as there is currently no singular definition for it. 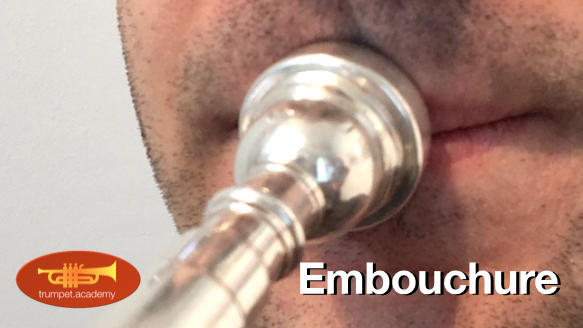 What does embouchure actually mean? Embouchure means, on the one hand, the position of the mouthpiece on the lips. There is little disagreement with regard to this. In short, there is a rule that determines that neither the upper nor lower edge of the mouthpiece should touch the red part of your lips. 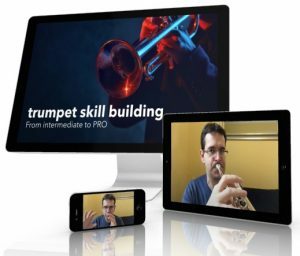 On the other hand, the term “embouchure” attracts a myriad of opinions as to what function the lips have while playing, what you should do with your lips, how much strength or endurance you have, how high you can play, how the lips feel, etc. I personally see it as such: that the lips react to everything that happens before the air gets there (intention, desired sound, air pressure and amount, etc.) or, expressed mechanically, that they must produce an opposite force to the air and create a balance in order to make a sound. In my view, the main “problem” is that the lips are so sensitive. They can feel absolutely everything, even when the root cause is coming from somewhere else. When, for example, the throat „closes“ during high notes, you might notice that your embouchure feels like sludge and think, seemingly logically, that you should do something different with your lips. Or it could be the other way around: during a performance, you get nervous and your lips somehow feel “different.” This could make you feel uneasy, and as a result you try to get the “correct” feeling back to your lips. Most of the time, this does not work; it only serves to make you tense, and you end up not being able to play as well as you did during rehearsals. Notice here: it’s not because of the lips, but because of you being tense, that you aren’t able to perform to your own standards. 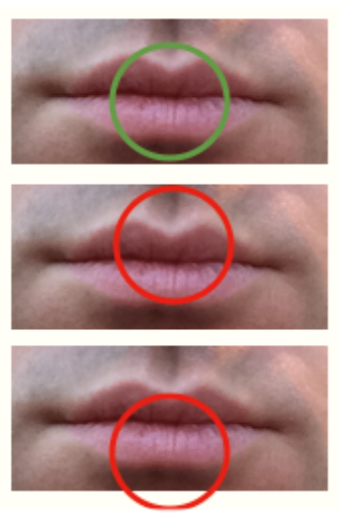 The good thing is, when you have mastered solid technique, it (almost) doesn’t matter at all how your lips feel. At this point, you don’t need a feeling as feedback, and can focus instead on the truly important things – ideally, the music itself, because your technique, regardless of feeling, is working reliably for you. Therefore, it’s all about trusting and developing your own technique. This might sound mundane, but it’s often not easy at all. Trust cannot be learned, nor is it possible to simply choose to trust more – but trust builds over time, and there is absolutely no way (to my knowledge) to accelerate this process. What you can learn, however, is to focus your attention on something more constructive than how your lips feel. This way, you can, for example, let the air flow in spite of an uncomfortable feeling in your lips, and keep your attention on the music. In other words: give your mind – constructive thoughts – preference over the feeling in your lips. What do you do when your embouchure feels strange? Do you have solutions that work for you? Or is this not a problem for you at all? Feel free to contribute to the discussion in the comment box under the article!